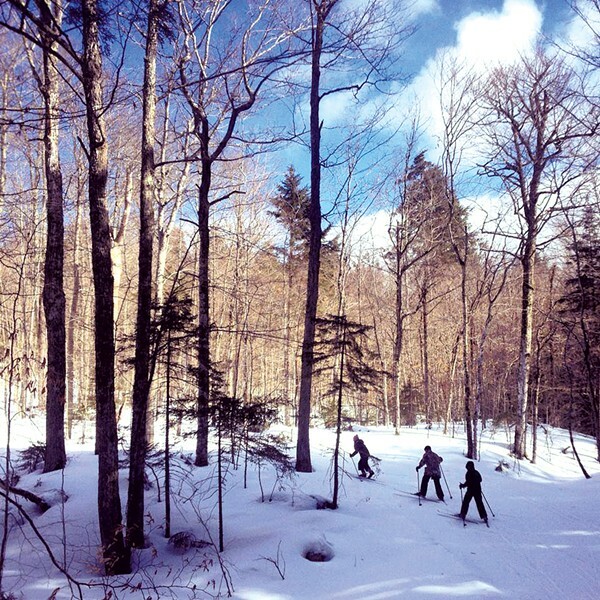 Making Tracks: Ten Spots for Family Cross-country Skiing and Snowshoeing | Fit Families | Kids VT - small people, big ideas! When winter gives you cabin fever, head for a different cabin — one nestled in the woods, accessible only by cross-country skis or snowshoes. Gliding and clomping through the snow is the perfect activity for families who never caught the downhill-skiing bug. It's also a total-body workout, burning as many as 1,000 calories per hour — take that, sugar cookies. BabyBjörns, fleece buntings and ski trailers allow infants to get in on the action, too, while fat biking offers a new option for pedaling through the powder. Below are 10 family-friendly spots for cross-country skiing and snowshoeing in Vermont, all of which offer rental gear. Once you're hooked, you can find your own setup at Burlington's Skirack and Outdoor Gear Exchange, or South Burlington's Alpine Shop, among other retail locations. So bundle up and get into the snowy woods. From investigating animal tracks to enjoying the peaceful, frost-covered landscape, an outdoor adventure may be the perfect way to keep the winter blues away.